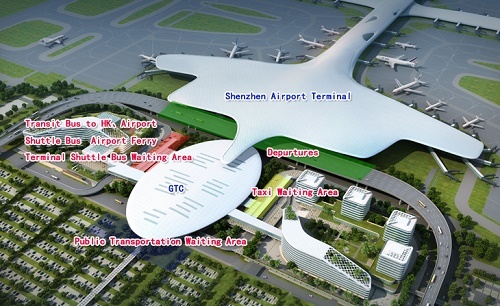 Airport bus station locates on the 2nd floor of Ground Transportation Center building (hereafter referred to as GTC) . Passenger to take the airport buses 330 to Shenzhen downtown can purchase ticket from the ticket booth at the southern side of Number G03 door. The airport's city bus (or transit bus) station locates to the south of the GTC building. Passengers can come here through the escalator or the vertical elevator through G07 door on the 2nd floor of GTC building. Pick up point of inter-city buses is on the ground floor of GTC. Passengers can use an escalator or a vertical elevator to get here from the 2nd floor of the GTC to purchase ticket and board the your buses for surrounding cities such as Macau, Zhuhai, Dongguan, Humen, Dalong, Qingxi, Qiaotou, Shilong, Houjie, Guangzhou, Jiangmen, Shunde, Zhongshan, Huizhou, Huiyang and Huidong. 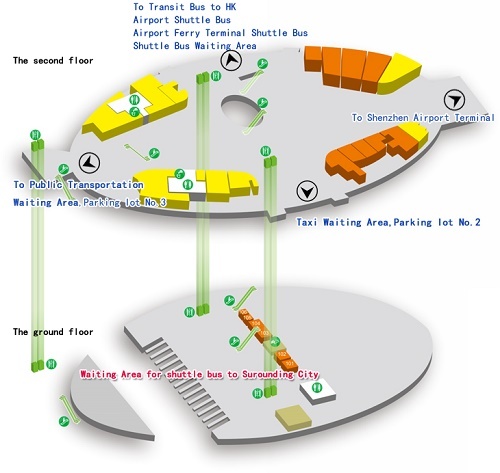 Pick-up point of transpit bus for Hong Kong is on the west side on the 2nd floor of the GTC building. Passengers can purchase tickets firstly and then pass through No. G03 gate to get to the departing area to board bus for Hong Kong.